I can guess many people's reaction to this: There was a PS/2 laptop???!!! Yes, actually, there were. At least four models...two of which were true laptop computers with battery power and all. I have three of these systems, but one has a dead floppy controller and cannot boot or be configured. The other two work, but both have exhibited very finicky behavior with certain floppy diskettes. Whether this is a drive problem or not I do not know, but it is annoying. 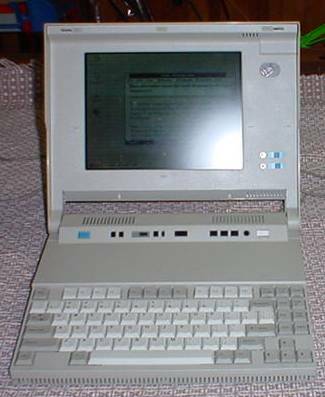 This is truly a neat system with a very readable monochrome STN LCD panel, 80386SX-20 CPU, and 18MB of RAM. The RAM used is unique--it is supposedly a low power design and most systems come with only the 2MB of planar RAM. Hacking 4MB modules has proven to be an option, but so far only one of those seems to be usable. While the 8MB SIMMs from IBM or other makers are hard to find, there have been successful attempts at misusing 16MB SIMMs to make the machine reach its maximum amount of supported RAM. You may wonder about the '18MB' designation in the equipment list below. While the 386SX CPU can only address 16MB of extended RAM (XMS) maximum, the left over 2MB is configured as EMS. It would be very handy to actually use this RAM, but Windows is incompatible with the driver and DOS programs that can successfully operate with it tend to misbehave severely under Windows. I have run the Calmira shell update on mine alongside Windows for Workgroups 3.11 after I learned of it from another C.S.I.P.H. newsgroup member. While Calmira did have a bug that made the L40SX thrash the hard drive incessantly and slow system response to a crawl, this seems to have been fixed in their latest version. Update 12/30/03: It appears that Calmira's original domain (calmira.org) has been taken over by some lowlife domain name harvesters. Update 06/13/05: Calmira is still available for download at calmira.net or calmira.de, but it looks like there have been no developments for quite some time. You may wish to grab a copy now even if you don't need one. I have no idea for how much longer Calmira II's web site will remain available. Lately I have also tried Windows 95 on this system. It works pretty well, and to be honest, performs better than Windows 3.1x since it does not run out system resources so fast. I am going to keep using Windows 3.11 on the machine though. My most recently acquired L40 is much more basically equipped...and I plan to leave it that way for authenticity's sake...after all, not many folks were carrying around an L40 like I have configured above! It has the same CPU and all, but the hard disk is the original 40MB and the RAM is the stock 2MB.